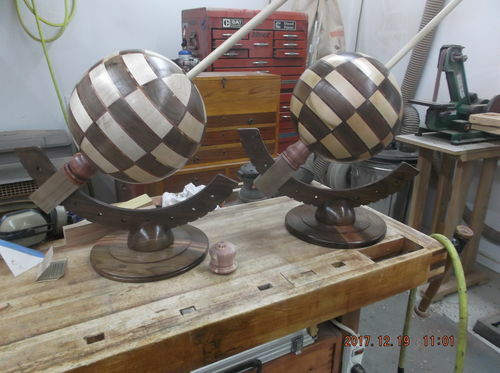 Now that I have the globe turned and a couple coats of shellac on it. It is time to turn to the base. I decided to use a 5/8 dowel for the globe axis so first I need to drill the globe. One of the advantages of turning between centers is you have the center marked for drilling holes. 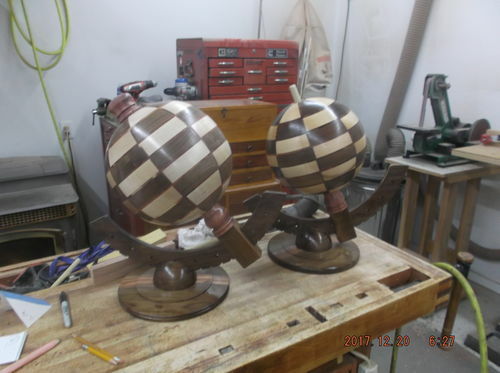 The globe is hollow so I only had to drill an inch or so from either end. 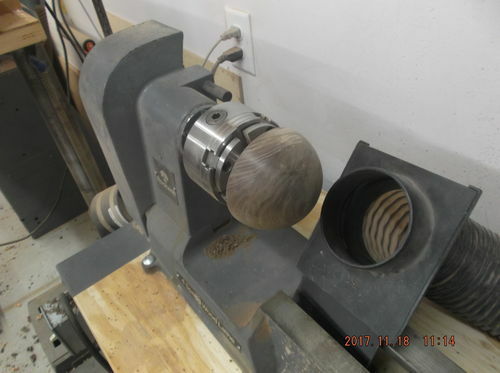 I also drilled a 1 1/2” counterbore in both ends for the mount spacer and top hat. 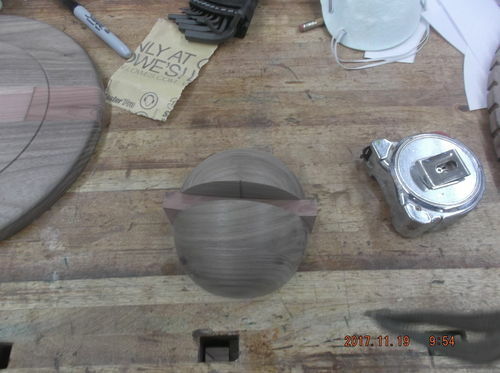 I had some fairly good photographs from instructables to use for the base just had to come up with dimensions and proportions. 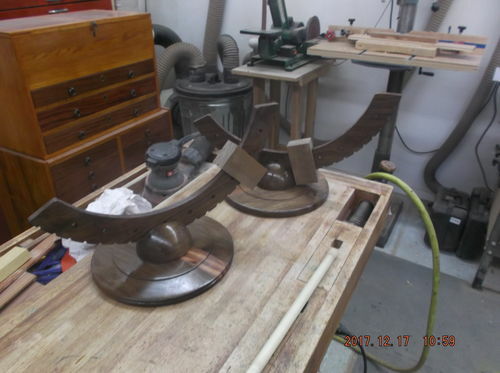 I decided to go with an 11” diameter base plate and about a 4” d by 2” high arc mount and a 16” inner diameter arc. I cut 1/2” out of the middle of this piece and glued in the cedar to match all the other mount parts. To make the arc I laminated up 2 1/8’ pieces of walnut with 1 piece of cedar. The cedar was glued in cross grain so this piece would have the strength to carry the weight of the globe and player handling. 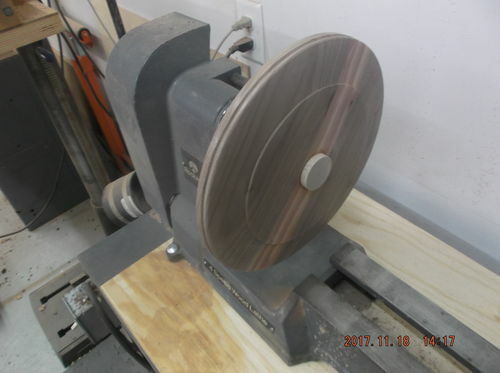 The arc mount is counterbored and has a 1/4” nutsert installed, The base plate has a tenon glued in and is counterbored on the bottom and a 1/4” bolt holds everything together and alow for the upper pieces to rotate. The rectangular piece on the arc was made from 2 pieces one side was dadoed out to fit over the arc and other side was just a flat piece glued on this gave me a little grain mismatch and I think a little more strength. Mount spaces and tophat. 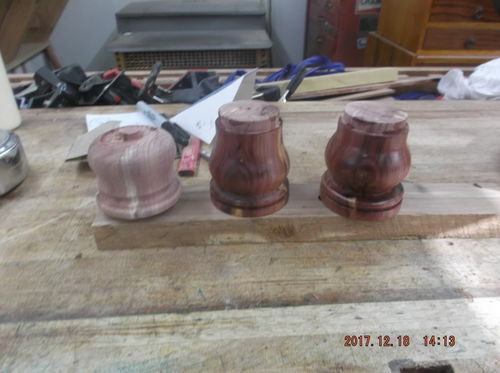 I just turned what I thought would look good and might be similar to chess pieces. At this stage I have no idea what chess peices will look like. 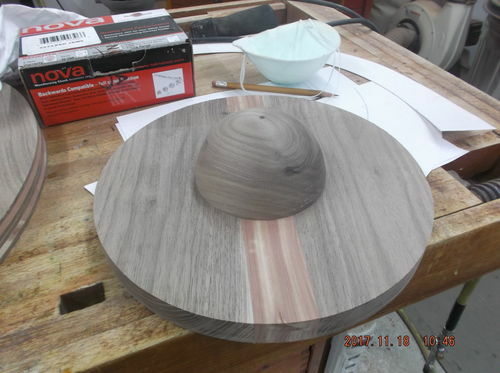 Need to cut dowels to length and fit top hats. Just need to figure out what and how to turn chess pieces. Bruce your globe is truly a work of art!! What a great project. To me it looks like a lot of problems to overcome. 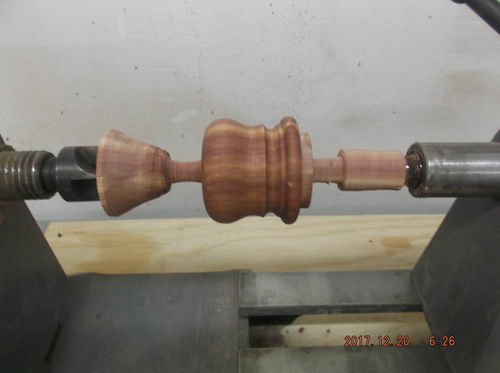 At times I wish I had a wood lathe, BUT I feel I’d need to step it up heaps to met the standard of someone like yourself sir, nicely done!